CNN Poll: Did Romney get a convention bounce? Charlotte, North Carolina (CNN) - It's the question everyone's asking: Did Mitt Romney get a bounce out of last week's Republican National Convention in Tampa, Florida? According to a new national poll released Tuesday, just before the start of the Democratic convention, the GOP presidential nominee appears to have received a one-point convention bounce, normal for the modern political era. A CNN/ORC International survey also indicates that less than four in ten registered voters said the Republican convention made them more likely to vote for Romney, but the former Massachusetts governor got a slight bump in his favorable rating, and on being in touch with the middle class and women, although he still trails President Barack Obama on those two questions. CNN's previous poll, released as the Republican convention got underway, indicated 49% of likely voters backing Obama, with 47% supporting Romney, a virtual tie. In the new survey, which was conducted Friday through Monday, entirely after the GOP convention, both the president and Romney are at 48%. "The Republican convention had at best a mild effect on the presidential race, and from a statistical viewpoint, no effect at all," said CNN Polling Director Keating Holland. "Demographically, Romney's overall one-point bounce masks some movement among subgroups and suggests that Romney's pitch to some groups may have worked but at the expense of turning off another group of voters." According to the survey, Romney gained seven points among higher-income Americans, but he lost four points among lower-income voters, among whom Obama now has a 15-point lead. That income difference may explain why Romney gained ground among urban and suburban voters, but lost support among voters in rural areas. The poll indicates Romney may have picked up support among men, but there was no change at all among women, keeping in place a double-digit gender gap. And there's an interesting movement among age groups. Romney gained a bit among younger voters and among senior citizens, but Obama was the big winner among voters between 50 and 64 years old. "It's possible that senior citizens who are already on Medicare have accepted the GOP assurances that their benefits will not be affected, but the group of Americans who are approaching retirement - who will be the first ones affected by the GOP-proposed changes in the Medicare system - are getting worried about what's in store for them," added Holland. Romney gained among independent voters, with a three point 48%-45% margin last week expanding to 52%-42% advantage now. So how does Romney's one-point bounce measure up in the history books? "It's pretty standard for all conventions conducted since 2000. Twice during that period, candidates got a two-point bounce; twice in that same time, candidates got no bounce at all. So Romney's one-point bounce is right in the middle of the range that political junkies have come to expect in the 21st century," said Holland. "Way back in the 20th century, candidates routinely got bounces of five to seven points, and double-digit bounces were often measured. But those days may be past us now - the combination of late-summer conventions, a compressed convention schedule, the increasing reliance on mid-summer advertising blitzes and an increasingly polarized electorate seems to have joined forces to dampen the effect of political conventions." The convention did affect how voters view Romney. He went from a 46%-49% deficit on being a strong and decisive leader to a 48%-43% advantage. On the question of having a vision for the country's future, he went from a three-point deficit to a four-point edge. And the GOP nominee gained about four to five points on questions about being in touch with the middle class and women, but Romney still trails Obama when voters are asked which candidate is more in touch with those two key groups. Romney slightly closed the gap on which candidate would do a better job handling foreign policy, and he maintained an advantage over Obama on the economy, although the convention barely moved the needle on that measure despite a laser-like focus on economic issues in Tampa. One thing that may have blunted the Republican convention's message is the perception by a majority in the poll that the GOP spent too much time criticizing the Democrats, leading only 36% of registered voters to say that the convention made them more likely to vote for Romney - a historically low number. 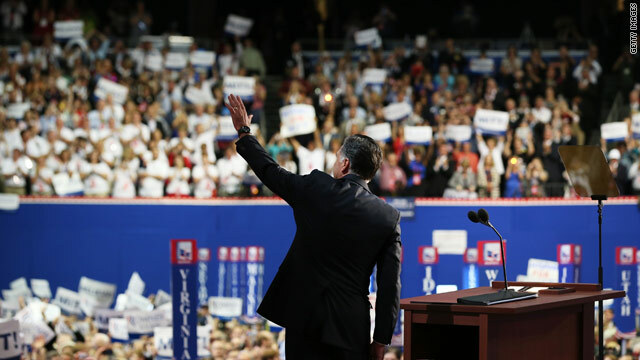 Forty-six percent said what they saw or heard from the convention made the less likely to vote for Romney, with 13% saying it made no difference to their vote. Romney's favorable rating appears to be on the rise, from 50% last week to 53% now, and his favorables have effectively matched Obama's rating among likely voters. But the president still maintains an edge on favorability among registered voters. Republican vice presidential nominee Paul Ryan's favorable/unfavorable ratings among likely voters went from 45%-39% last week to 49%-38% now. The CNN poll was conducted by ORC International August 31-September 3, with 1,005 adults nationwide, including 877 registered voters and 735 likely voters, questioned by telephone. The survey's overall sampling error is plus or minus three percentage points, with a sampling error of plus or minus 3.5 percentage points for registered and likely voter questions. BREAKING NEWS to CNN: This is the week for the Democratic Convention. How about reserving the headlines this week for the DNC, as you reserved the headlines last week for the RNC. Romney and his sordid and phantasmagoric cast of untruth tellers got all the press last week, and weren't required to share the limelight with others. Why are the standards different for the DNC? Romney got all of a 1 point "bump" or "pimple" or whatever you want to call it. That means that people have heard him at his best, and THEY STILL DON'T LIKE HIM. People were baited and cajoled into watching all of his nutty supporters, including lyin' ryan...and THEY STILL DON'T LIKE HIM. They heard from the Dressage Horse woman and Lyin' Ryan: AND THEY STILL DON'T LIKE HIM. So, in the interest of fair play, how about putting the corporatocracy's love affair with the whining wanna-be, BEHIND us. That was last week. This week the limelight should shine on the President of the United States, Barack Obama, and the Democrats and working class people. I could care less who wins. I couldn't stay awake during the Republican convention and I'm sure the Democratic one will be just as boring. Candidates will say just about anything to get elected. I just a 2008 article indicating McCain got a healthy 10-12 bounce after the 2008 Repub convention. Of course, that won't fit with the Romney World Narrative. Let's all hope for an Obama convention bump. A bump right out of the White House! Watch the ratings this week trump the GOP convention. This election is about Obama and his plans going forward. The GOP spent months trying to figure out which lousy candidate was better than the last. They had 8 or 9 front runners in the space of three months and in the end settled for their number 2 choice. And were supposed to believe what CNN tells us? Lmao...The last time i remeber, it was CNN's staff last week that plagirized!!! um, you take the paul write ins, add the no not going to vote as long as you start wars people, (now that I've realized that is what you do for a living) – and factor in that cnn has a young liberal following in the US. – it makes statistical sense. one point is actually allot for that environment. Dumbest poll ever! CNN is by far the worst news reporting agency on the planet. The CNN poll was conducted by ORC International August 31-September 3, with 1,005 adults nationwide, including 877 registered voters and 735 likely voters, questioned by telephone. Who the heck cares about "likely" voters? Really, CNN? I dont know if Mitt Romney wins or looses. But country will be certainly better off if Obama goes away. One in two college graduates are unemployed or underemployed now. 6 million dollars spent per job from stimulus. An average 5th grader can spent the money more smartly to create jobs than the amount of tax payer money wasted from stimulus. Is that why he went up 4 points in N.C.? Bounce – dribble – dribble – roll.... it will soon be back to as before, after the next .... bounce – dribble – dribble – roll. 1 point bump up for Romney, but the real news is that Eastwood got a 100 point bump! fivethirtyeight....enough said. CNN and most news outlets reason for these polls is to make the election look closer then it really is. If folks remember 2008 was seen leading up to the election as it was going to be some narrow win, when in fact Obama blew the doors off McCain's campaign. Why? Cell Phones. More and more younger people are going from land lines to cells and the only people who still have cells are middle age or older those more likely to vote Repub. Romney doesn't give a Mitt about anyone who isn't rich or own a business. I voted out Bush for second term before, and I will vote out Obama for second term as well. They all had a failure score on their first term on US economy issues. Same for Romney if he too will fail on this first term, but will give him a chance as least for his first term. I'm a black female, very educated, and makes six figures:-) I have never lived in a ghetto, nor have I ever been polled. In other words.........Mitt and his no truth telling puppet should be very, very worried. Once again all we're allowed to select from are two empty chairs running for national office. Our country, and the planet, continues sliding into oblivion and we get are pandering, promises, and promiscuity.